Today's blog is from Rob. Up at 4 am & I put on my blue under pants today. Across Delhi in the normal minibus but no traffic apart from water cannon and 300 riot police. Didn't know they would be so upset by us leaving. Pulled up at the side of the road and unloaded bags, apparently this is the railway station, crossed busy road dragging cases and Julie under a bridge and sure enough there's a station. Usual murder death and mayhem that's an Indian railway station, narrowly avoided wrong train and off we go. 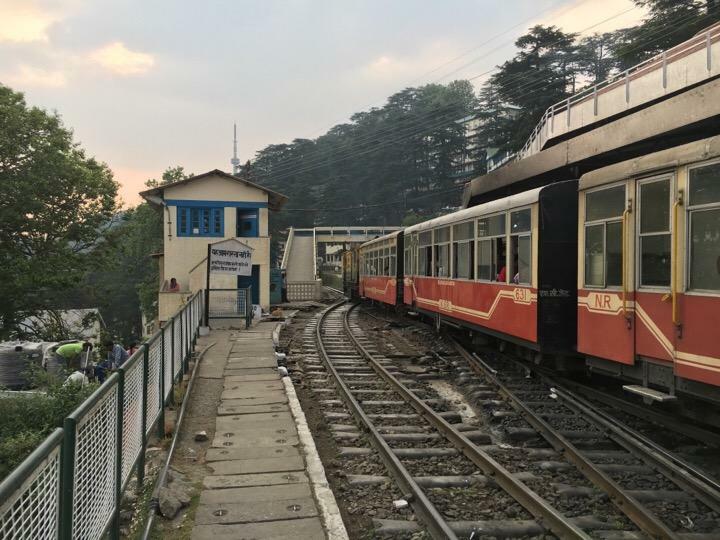 We were planning to go all the way from Dehli to Shimla by train. Main train to Kalka and the by narrow gauge 'toy' train from there on to Shimla. However the tour organisers told us about three weeks ago that although we had requested this about 9 months ago they had failed to get us tickets from he toy train up the hill. They tried to fob us off with a 1 hour excursion instead, but we insisted that we wanted to do the whole train ride so we think they have arranged for us to do the train ride down. We would be picked up at Kalka and taken up the hill by car. We got on the train Ok and the journey was very pleasant with tea ( made from your own flask of hot water) and biscuits and samosa lunch etc. We were just at the station before we were supposed to get off when Dave spotted a bloke on the platform with a sign 'Wastell x 4'. Odd says he, looks like we maybe be getting off here. - I'll just go and check. Sure enough the travel rep is here and we get off the train in double quick time with all our cases. The rep has arranged porters for our cases and they grab the bags place them on their heads and disappear off into the crowd (after all you don't want to idle about with a suitcase balanced on your head. We catch up in the car park and there are two cars. Barkers in one, Wastells in the other and off we go up the hills. Journey time approx 3 hours. Our driver stops at a roadside tyre repair station and gets the offside front tyre inflated. A good idea with three hours of cornering coming up. Now he is behind the others and proceeds to give a masterclass in Indian overtaking manoeuvres into on coming traffic on tight bends and through several miles of duel carriageway roadworks. So long as he doesn't kill us. Going up we cross the train track several times. Lunch stop was quite pleasant sitting outside in the sun. Something we haven't done anywhere else in India. This is why the English retreated up the hills in summer. 1 hour more and we see Shimla in the mist across the valley, quite an extensive place set on a ridge in a saddle between two slightly higher peaks. A place of history, legend and TV documentaries.